In 2014 we planned a trip involving a couple of weeks in Sri Lanka over Christmas followed by some time in the Middle East, primarily to visit Petra in Jordan (click here for our post on Petra in the Snow). We also wanted to visit Israel and Istanbul. It occurred to us that flying from Sri Lanka to Jordan meant over-flying the Arabian Peninsula. So, why not stop somewhere on this route? We’d been to Dubai previously so didn’t want to go back to the Emirates. A quick look at a map and the obvious choice that leapt out was Oman. Though fairly low-profile as a tourist destination we did know that it was considered stable and safe. We decided to do more research. It revealed that Oman is a country of 3 million. It has a traditional Islamic culture and is known for its hospitality and tolerance of other religions. It does not have the wealth disparities of its neighbours, or their crowded, high rise city scapes. It has been ruled by Sultan Qaboos since the 1970s. Oman has a rich history highlighting it’s role in the ancient frankincense trade, it’s redoubtable coastal forts built to ward off invaders from the sea, and it’s impressive modern Islamic architecture. Yes, there are deserts of course. That’s what we tend to conjure up mentally when Arabia is mentioned. But Oman has much more – the Hajar Mountains which guard the coastal strip for several hundred kilometres; countless clean, white sand beaches; its many wadis (ravines or stream beds that only flow during the wet season); and Arabia’s Grand Canyon – Wadi Gul. On top of all that it has a well-educated population, English is widely spoken, and tourist visas are available on arrival for Australians and many other nationalities. We were sold. So, we booked for a one-week whirlwind stop-over. Here’s how we spent the week (there's a route map at the bottom of this post). Muscat, a city of 1 million, is Oman’s capital. It is often referred to as a city of three ports – Ruwi, Mutrah and Old Muscat. Ruwi is a fairly modern, commercial area so we weren’t too interested to see it given our limited time. Also, it is around 6km from Mutrah, which is the heart of Muscat. Mutrah has an impressive corniche (seaside promenade). It is walking distance from Mutrah to Old Muscat, where the Sultan’s Palace is to be found, so we decided to head to Mutrah and Old Muscat and stretch our legs. Muscat means “safe harbour”. It is a port city surrounded on three sides by mountains. To protect the coastline from enemies the inhabitants built numerous forts. During a brief period of Portuguese control in the 16th century the invaders also built forts, including Mutrah fort which is unmissable at the eastern end of the harbour. We strolled down the corniche before ducking into Mutrah Souq (market) to see what was on offer. There are also plenty of restaurants in and around the souq. We later walked down the corniche as far as Al Riyam Park and the restored Portuguese Watchtower which sits on a small promontory jutting out into the sea. It was getting late and there was still a way to go to Old Muscat, so we decided to leave that for another day. Next morning we jumped in our hire car and drove west on a good road across the Hajar Mountains to the desert oasis town of Nizwa. This was a two hour drive. First stop was 19th century Nizwa Fort. After lunch at a café near the fort we went into the main part of the town to feel the vibe. The central area is dominated by the impressive modern mosque. We cruised the streets and took it all in. 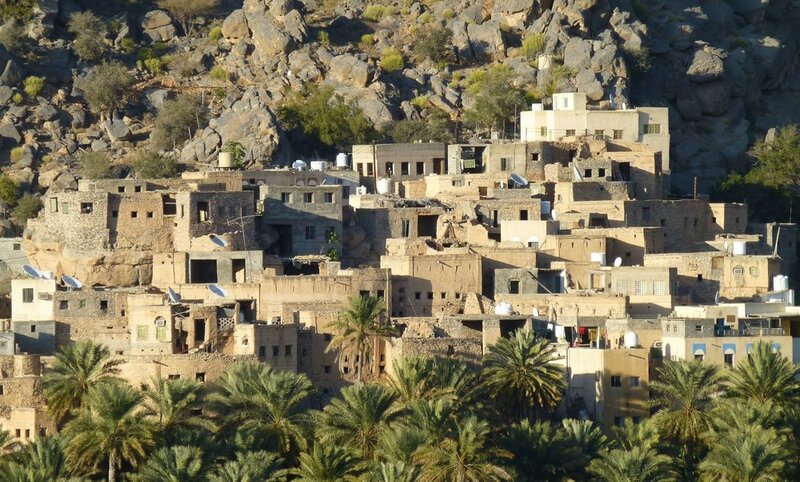 Nizwa is also the gateway to many attractions, especially the surrounding mountains. After our night in Nizwa at an Airbnb we drove to nearby Bahla Fort. This 12th century fort is a well restored UNESCO World Heritage site. 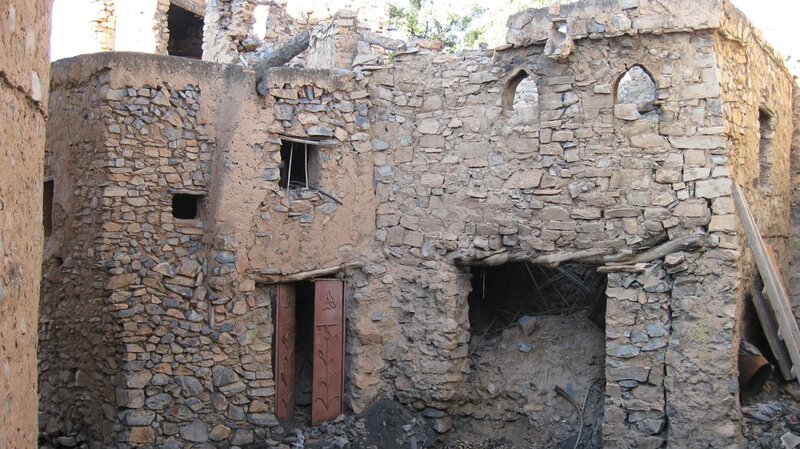 Bahla is a walled city and the walls are evident in many places. We enjoyed exploring the fort. Unfortunately, there were no interpretive panels (in either Arabic or English) when we were there – January 2015. We had the distinct impression that you were expected to hire a guide if you wanted to know more about the fort. We then drove into the mountains to get a glimpse of Wadi Gul, the Grand Canyon of Arabia. The road climbs up Oman’s highest mountain, 3015m Jebel Shams. The sealed road ended part way up the ascent to the canyon viewpoint. It then became a four-wheel drive unsealed road. Several enterprising locals were waiting at the transit point in their off-road vehicles waiting to take tourists to the top. We left our conventional vehicle at this point and hooked up with Mahmood who tore up the mountain in his ageing, rattling 4x4. The views were well worth the bother. It was then back down the mountain and off to the traditional Omani mountain village of Misfat. The village is pedestrian only with parking on the outskirts. We stayed at Misfat’s only accommodation (at that time) the very pleasant Misfah Guest House. We took an afternoon tour to get a better understanding of traditional village life. As it turned out, we were the only ones on the guided walk around the town. We learned from our guide, Mahmood (obviously a popular choice of boy’s name), who had grown up in Misfat, that most of the buildings were now empty. In his boyhood this had been a thriving community with an economy based on lemon cultivation. But a lemon blight had arrived some years ago and wiped out the local industry and livelihood of most residents. There were now only a handful of families still living there. The village was endeavouring to resurrect itself through offering a traditional village tourism experience, but it was still very much early days. After our three-hour tour Mahmood invited us to his house in the newer, modern part of Misfat where we met his family and enjoyed tea, dates and fruit. It was real Omani hospitality and we greatly enjoyed it. We wanted to go to a wadi so we drove to Wadi Shab on the coast between Muscat and Sur. To get to the trail which leads up the wadi we took a short boat trip across a stretch of deep water to where the track starts. Wadi Shab appropriately means “gorge between cliffs”. We walked up the ravine until we came to several natural swimming pools. Even though it was winter the daytime temperature was 28C degrees. Very pleasant for swimming. We swam through a narrow crack in the huge rock face in the final pool to find a stunning waterfall inside a cave, with one shaft of sunlight falling from a small hole in the cave roof. Fabulous. After a relaxing couple of hours at the pools we returned by the way we came and drove the short distance to the town of Sur. Sur is famous for its dhow building (traditional sailing ships). And these were very much in evidence. Sur also has a pleasant corniche, a couple of forts, and long stretches of beaches. We did some exploring around town before retiring to our beachside hotel. This was to be our last full day in Oman. We drove the coastal road back to Muscat. We stopped for a dip at Hawiyet Najim Park (Sinkhole Park). The sinkhole is beside the highway so it is an easy stopover. It makes for a refreshing break on a hot day. Back in the capital we did some exploring around Old Muscat. We had a look at the Sultan’s Palace, the Omani-French Museum and the Portuguese forts of Al-Mirani and Al-Jalali. We also visited Al-Riyam Park and the nearby Muscat Gate Museum, which is built on the site of the original city gates. 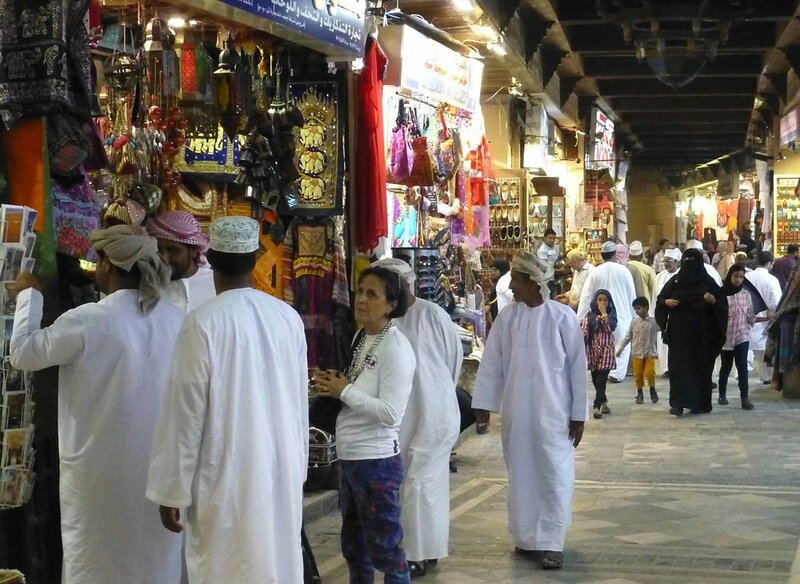 We then went back to Mutrah for a final visit to the souq to buy some frankincense. We finished our day with a great meal at a nearby outdoor restaurant washed down with some delicious pomegranate juice. One week (in fact, only six days) was far too short. There is much more to Oman, including the southern region around Salalah, close to the Yemeni border, which is subtropical and historically linked to trade in gold, frankincense and myrrh. 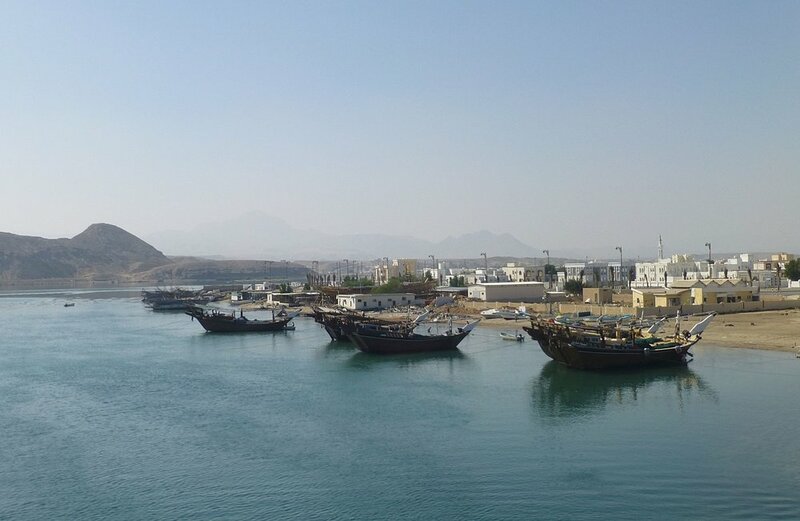 There is also the Musandam Peninsula, cut off from the rest of Oman and bordered by the Emirates, with its mountainous roads and traditional villages. And the island of Masirah, a desert island with sandy beaches and abundant birdlife – to name just three possibilities. 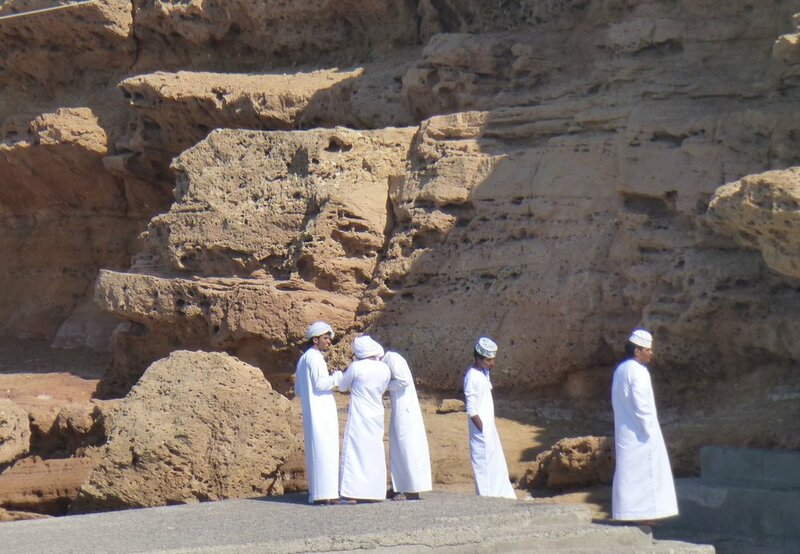 If you want to know more here are two links to useful Omani tourism sites: Destination Oman and Tourism Oman. But, even though it was only a short trip it was well worthwhile. We thoroughly enjoyed Oman. The people are friendly with a strong tradition of hospitality, and the country is visually stunning with a fascinating history and culture. In a region that has a lot of problems Oman is safe and welcoming. If it is not already on your “must visit” list it should be. NB: A note on dress codes. Most Omani women dress traditionally in a long, ground length black gown (abeyya) and headscarf (hijab), some veiled (burka). As a westerner Cally dressed in her usual western garb but ensured that arms and legs were covered – long sleeved and long tailed shirt and jeans. In public she usually wore a scarf over her head and found that local people, especially women, were more open and approachable when she was wearing the scarf. Without it they tended to be guarded and avoid eye contact. Men vary between those wearing western style dress and the traditional dishdashi (full length dress shirt). Ken wore long pants (jeans) and long-sleeved shirt throughout the visit.